Newcomer Family Obituaries - Flora Romans 1937 - 2019 - Newcomer Cremations, Funerals & Receptions. Flora Romans, age 81, went home to be with the Lord on Friday, April 12, 2019. One of twelve children, she was born September 5, 1937. Preceded in death by her parents, Luke and Flora Simpkins, and her husband, Curtis Romans; brothers, Matthias, Ulyessus, Billy Floyd, Elisha and by sister, Ida Mae. She is survived by her brothers, Nathaniel and Octavious; sisters, Bertha, Elizabeth, Lauenia and Geneva; children, Donna (Scott), Larry C. and Glenn J; grandchildren, Melissa (Shaun) and Erica; great-grandchildren, Layla, Connor, Lance, Tyler and one soon to be, Gunner Reed; also survived by numerous extended family and friends. She was a member of the Columbus First Baptist Church and on occasion would attend the Church of Christ in Christian Union in Johnstown, OH. 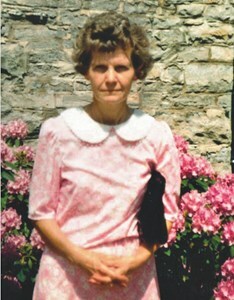 Flora was a hard worker, avid gardener and loved sewing and crafts. Visitation will be held Wednesday, April 17, 2019 from 12-1PM at Newcomer Grove City, 3393 Broadway, where funeral service will begin at 1PM. Burial to follow at Franklin Hills Memory Gardens, Canal Winchester, OH. In lieu of flowers, she would have wanted a donation made to the Columbus First Christian Baptist Church. Add your memories to the guest book of Flora Romans. I am so sorry to hear if your loss. I loved your mom. She was always so sweet to me. I still have a bracelet she gave me that has my name on it. I remember the family coming into church on Sunday mornings all in a row in one pew. My mom and dad thought a lot of your mom and dad as did I. May your mom and dad Rest In Peace now.